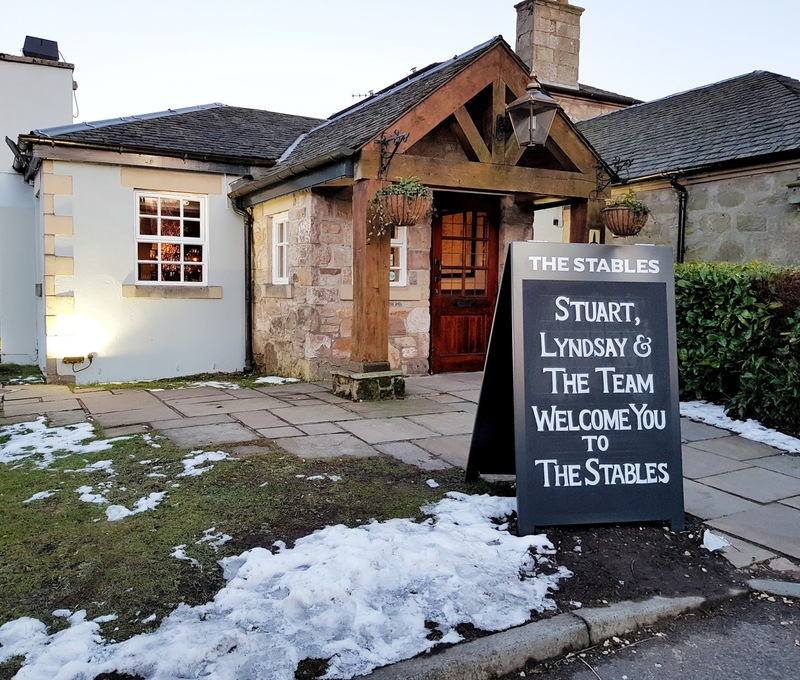 Finding a good place to eat is one of the best feelings in the world, somewhere with a great atmosphere, lovely food and friendly staff makes the experience worth it and I have to say, The Stables in Kirkintilloch has all of these. 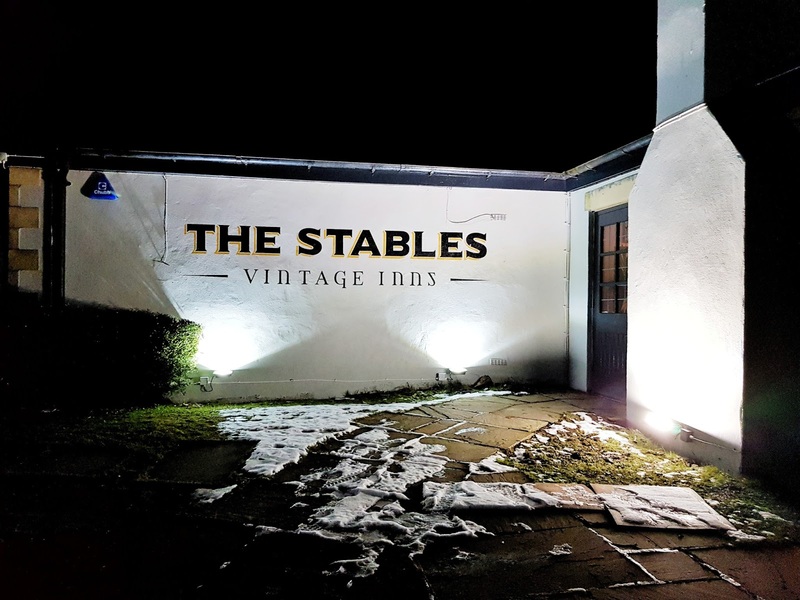 I remember going along to The Stables a few years ago before it had been refurbished and to be completely honest I wasn't much of a fan but the place has been redeemed in my eyes! The whole experience was really nice and I'm so glad I went along again to experience what it's like now. From the moment we walked inside I felt like the atmosphere changed, it was nice and quiet but had a great friendly atmosphere to it, there were groups of people sitting around at the front of the place but we were seated near the back next to a beautiful real burning fire, I was in heaven to say the least as it ticked all my aesthetic boxes. The woman who was serving us (Rachel) was just super lovely, really friendly and we had some good chat throughout the night. It was great actually being able to ask someone what they would recommend and actually loving her recommendations (The coconut milk sorbet was heavenly). Both Stephen and I were extremely impressed with the whole night and I can definitely confirm I'll be back but next time on a lovely sunny day so we can sit outside and when there's loads of dogs!!!! (Yes, they are dog friendly omg my heart was pounding). It's great that they cater for dog walkers as it's situated in an area that will have a lot of people walking along the cannal with their dogs so it's great there's a place to go, get refreshed and have your dog come with you and the dog area isn't just outside, they have a little area inside where you can get cosy on a cold day or relax at night whilst having your four legged friends with you. 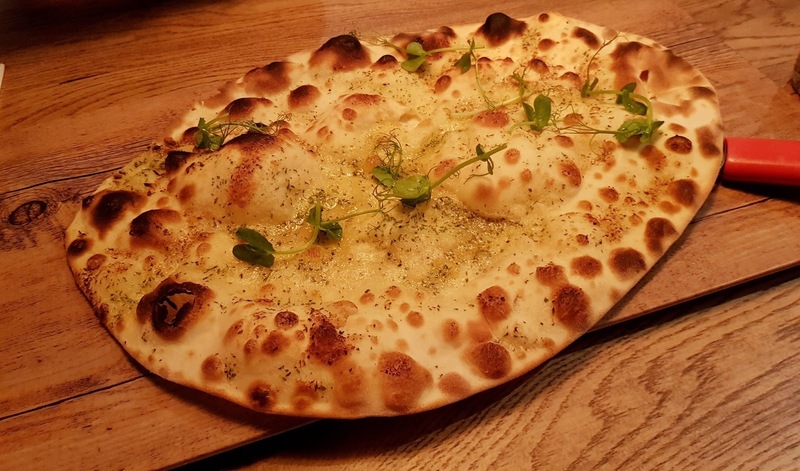 For starters we opted for the stone baked garlic bread, we were originally going to get two but the lady who was serving us recommended we get one between us as it's rather big and I'm so glad that she told us that because wow! it was huge! definitely perfect for sharing, I'm so glad that Rachel (the woman who served us) told us to get one between us. The garlic bread tasted absolutely amazing, for some reason I am really digging garlic bread at the moment and this hit the spot perfectly. Stephen isn't a huge fan of garlic bread so to see him eat half of this was something else, he was licking his fingers afterwards saying how good it was. For our mains we came to a compromise on getting different things because everything I wanted Stephen wanted as well haha I went for the Aberdeen Angus burger served in a brioche bun, topped with smoked Cheddar and served with bacon chutney and homemade onion rings but I got mine without the cheddar as I'm not eating cheese anymore but the burger was just delicious, the Bacon Chutney was just mouth watering, if you ever go I definitely recommend getting it, even of you ask for it on the side of what ever you get. The burger has to be one of the best I have tasted in a restaurant, it melted in my mouth. 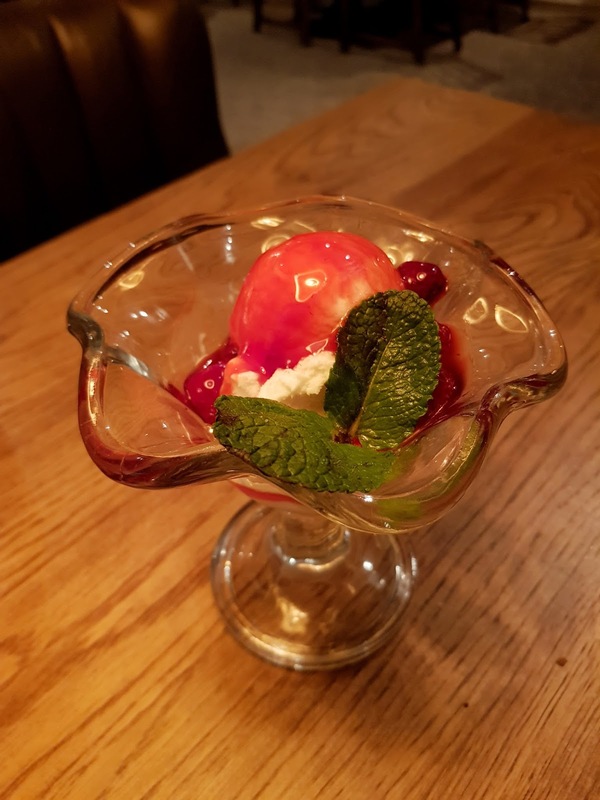 I do have to say that the meal was extremely filling, I couldn't finish the whole thing but that was no reflection on the standard of the food, it was just simply so good and filled the spot amazingly. 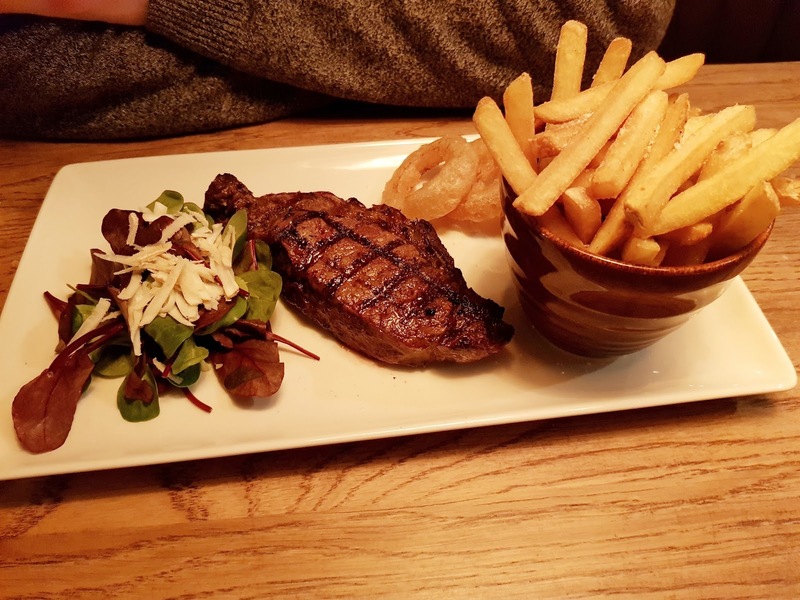 For Stephens main he went for the 8oz Sirloin steak with the skinny fries, the steak was cooked just the way he likes it and he ate the full thing. From what I gathered, he loved the meal, I mean he wouldn't have ate it otherwise. The full meal was just delicious, I couldn't fault it at all. I did have to make sure I left some room for desert though because so many of them sounded amazing. For the dessert I decided to get the Coconut Milk Sorbet and The Melba Mallow Mess, Stephen doesn't like dessert so I was greedy and went for two, because you know, why not! Both tasted amazing. The coconut milk sorbet was really refreshing and perfect for a pallet cleanse, I've never had a coconut milk sorbet before, I didn't even know it was a thing if I'm honest but it was seriously yummy. 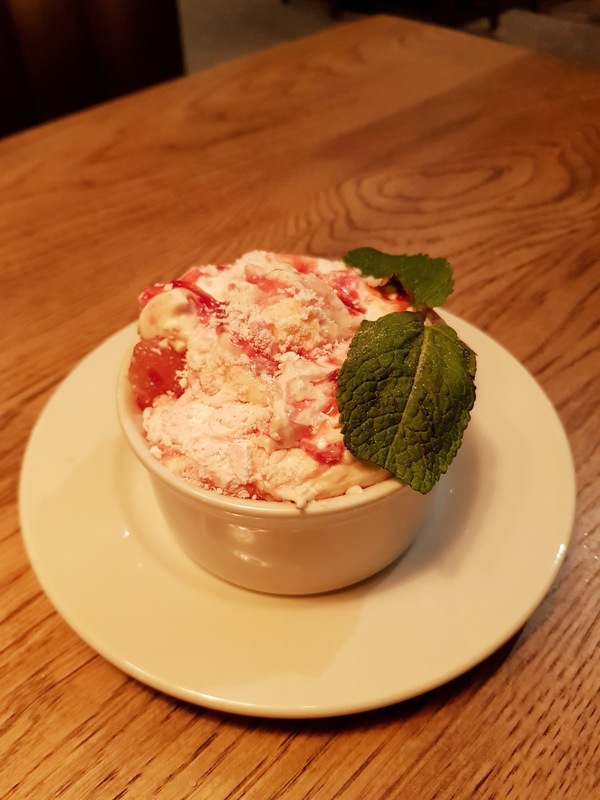 The Melba Mallow mess is more of a dessert perfect for a sweet tooth, I wasn't able to eat it all because of how full I was as this is filling, I could imagine it would be a perfect choice for a coffee/tea and a sweet treat of a really nice day. Both desserts were great for very different reasons and I'm glad I got to try two. All in all my visit to The Stables was a success, the whole experience was amazing and I really cannot thank Rachel who served us enough for being so nice and recommending fantastic deserts, She really made the experience what is was. The food was delicious and I really love that the choice on the menu is so great with fixed price menus available as well. The place is dog friendly (major points) it has a cosy atmosphere and it's situated in such a lovely place with great views. If you're ever up that way then drop in and tell them I sent you, then ask for Rachel and go pet all the dogs.... I mean, what an amazing way to spend the day!!! Oh my... the coconut milk sorbet sounds and looks amazing!! Oh, goodness! I am ready this before breakfast and now I want a burger and chips! haha Sounds like a lovely place - always nice when you find somewhere you particularly like, isn't it? I will have to check out this place if we go over there. 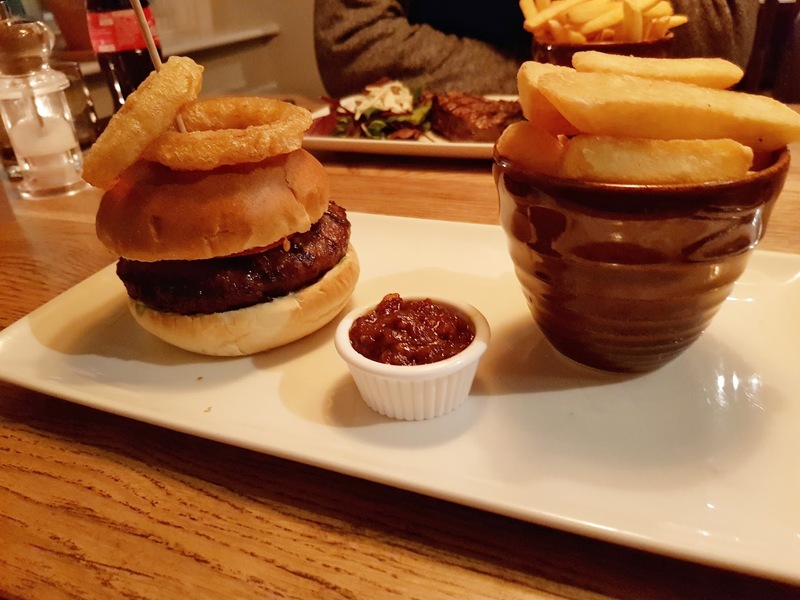 I like nothing else than a good pub like that and this burger looks super good in my opinion! The food looks so delicious! This looks like a really great place to eat. I want to go there now!